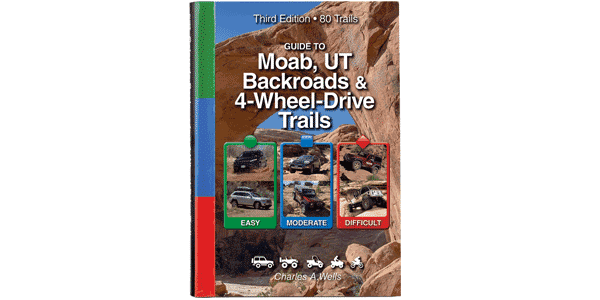 One of the longest and most popular trails in Moab, with nonstop obstacles and many stunning overlooks. Its length comes from the fact that, to complete the trail, you must drive half of Poison Spider, all of Gold Bar Rim, and part of Gemini Bridges Road. Because breakdowns are common, it’s not unusual for people to finish well after dark. It is recommended that you start early and travel with other vehicles that can help. We thought the trail would be more challenging for our RZR, but it got through fine, including getting over the Golden Crack. The trail is extremely difficult for riders of ATVs. Modified vehicles with very high ground clearance, big tires, body armor, and lockers both ends. Articulation is severely tested. We drove it in our 2-door Rubicon (see specs on page 10). We foolishly attempted optional Double Whammy and exploded our rear drive shaft. We had to finish the trip with front drive only, winching up the remaining obstacles.